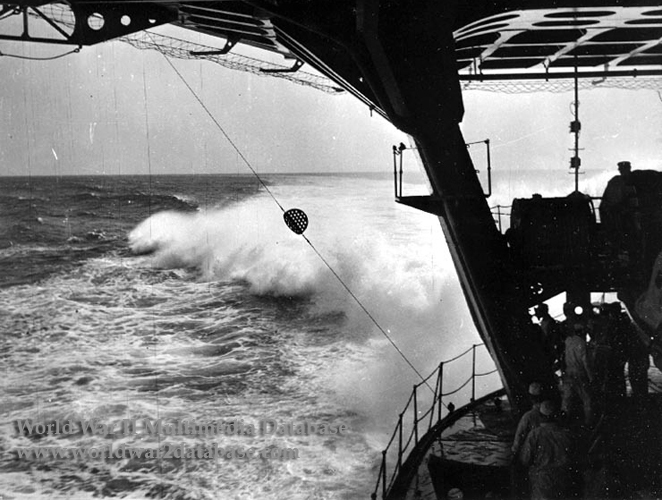 View of the ship's wake from the after end of the boat stowage deck of IJN Soryu ("Blue-Green Dragon"). This view was taken during her builder's trials in Bungo Suido Channel between Honshu and Shikoku by Kure Kaigun Kosho ("Kure Naval Arsenal") under Chief Equipping Officer Captain Akitomo Beppu. Soryu left Kure Navy Yard on November 11, 1937 for her shakedown voyage via Hiroshima Bay to Iyo Sea. After that she participated in a series of sea trials. With a displacement of 18,871 tons, Soryu developed a maximum speed of 34.898 knots on 152,483 Shaft Horsepower. The round object suspended from the flight deck is a helm direction indicator. At speeds over 30 knots her flight deck was heeling more than 10 degrees with each turn, making walking on it rather difficult. Note underside of the flight deck above, heavy supporting brace between the main and flight decks, and safety netting around the flight deck edges. Soryu, the lead ship of her class, had a cruiser hull design, eight boilers and four turbines; she could outrun IJN Kaga without even achieving her top speed. She was commissioned on December 29, 1937. Soryu's actual displacement of 18,871 tons was a secret until after the war; she was reported at 10,500 tons to comply with international naval treaties. Soryu was assigned to Carrier Division 2 of the First Air Fleet (Kido Butai - "Mobile Force") on April 10, 1941. She participated in the raid on Pearl Harbor, supported the landings on Wake Island, raided Australia and the Indian Ocean, and was sunk during the Battle of Midway in June 1942.